Myeloid white blood cells. Coloured scanning electron micrograph (SEM) of human myeloid white blood cells found in bone marrow. 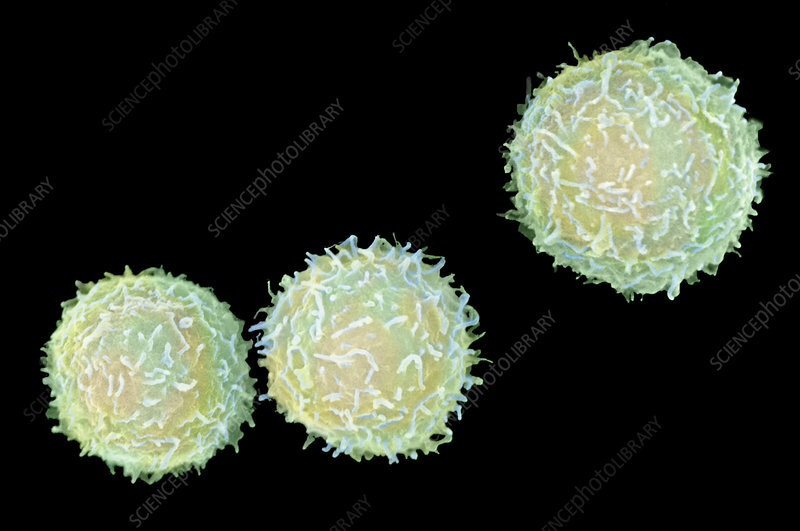 A type of leucocyte, these myeloid cells give rise to many types of white cells in the blood. They are undifferentiated, rounded in shape with typical protuberances on the cell surface. As a precursor cell in the bone marrow, they give rise to platelets, and white blood cells that play a role in the immune system (monocytes, neutrophils, eosinophils). The human myeloid cell line depends on growth factors to survive. These cells can be grown in culture successfully but do not differen- tiate. Magnification: x2,000 at 6x7cm size.